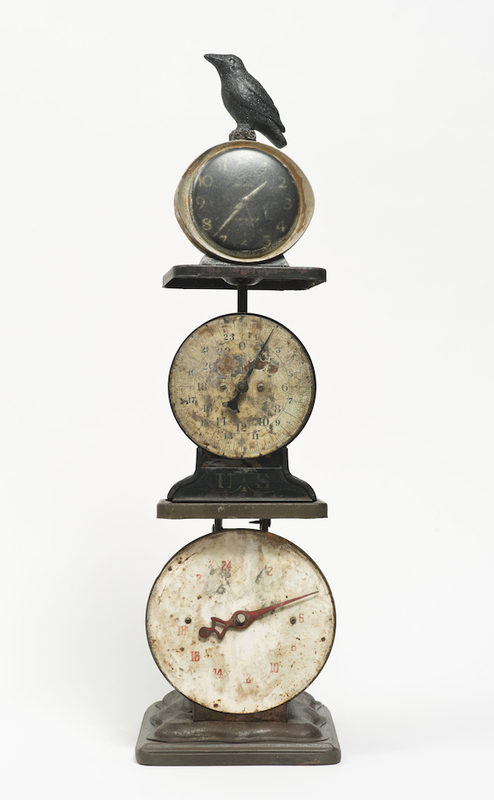 Betye Saar, Weight of Persistent Racism (Patented), 2014, mixed media assemblage, 25 x 9 x 7”. Courtesy of the artist and Roberts & Tilton, Culver City, California. An icon of assemblage art whose work has stood proudly at the intersection of the personal and political since the 1960s, Betye Saar draws from such broad references as the work of Joseph Cornell and occult traditions of palmistry and voodoo. In her groundbreaking 1972 sculpture The Liberation of Aunt Jemima, for instance, Saar issues a challenge to stereotypes of race and gender by reclaiming the power of historically charged materials. Here, as Saar approaches what she calls her “ninetieth revolution around the sun,” she discusses her current retrospective, which brings together works from across her six-decade career. The exhibition is on view from January 30 through May 1, 2016, at the Scottsdale Museum of Contemporary Art in Scottsdale, Arizona. When I was young, my mother was always encouraging us to draw and take craft classes. My grandmothers made quilts and painted china, and my mother was also gifted at making jewelry and sewing. That’s what women did then, and it was just a natural thing to follow. One of the things that moved me away from printmaking and two-dimensional works was inheriting the remains of my great-aunt’s trunk. She moved from Kansas City, Missouri, to California in the early 1920s, and when she passed in 1974, there were all these objects that had belonged to her when she was a girl—dance cards and invitations, handkerchiefs, gloves, and dresses, things like that. That was the start of using something from a previous generation and integrating it into my own work. I felt like I was paying homage to her, as well as expanding on my own creative expression. Light is an important element for me, especially with these installations. I’ve had some experience with theater—I think that’s one reason why I feel comfortable doing my little assemblage boxes, because they’re very theatrical too, but mini-sized. And then when I started making installations, I could blow them up to room size. One of the more recent pieces in the show was originally shown in a tableau in my 2013 exhibition “On the Shelf” at Roberts & Tilton Gallery—just a simple shelf that had all these objects on it created from found scales. It was inspired by the recent events of violence against black people over the last two or three years. There are countless police shootings of black people—so I thought, This is how I can vent my anger and frustration, and it’s called Weight of Persistent Racism (Patented), 2014. I used the scale as a physical object to determine that weight, how it just won’t go away, against black people, and others. I think of my process as a personal ritual: The first part would be finding the materials, the hunting and gathering. I go to thrift and antique stores or estate sales, looking for things and picking objects that have a sense of history or a story to tell. Then I move into the second part of the ritual, which is combining these pieces and manipulating their surfaces so they can tell another story—my story. Sometimes I work in a subconscious way and let the piece create itself—it’s a lot more fun to do it that way. The final part of the ritual is the release of the work. I’ve always had a really vivid and active imagination, ever since I was a kid, and so every time I see objects, my mind just goes wild. Not that I can always verbalize what that is, but it’s a feeling that says, “If I had that, I would use it in a piece of art.” Similar to what a bowerbird does—sometimes they are so creative that they even select a color, and then they only collect that color. When the male sees a female, he makes a little arrangement to impress her, to woo her. I think it’s really interesting that when this behavior moves into the human world, we call it art.